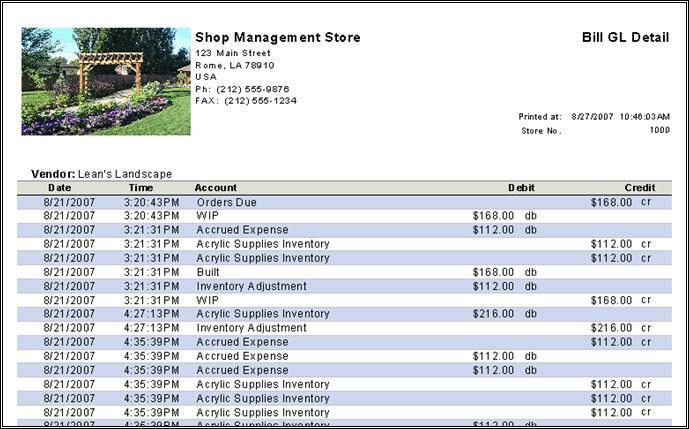 Another feature of the accounting module is the ability to manage bills, or invoices, out of Control. Similar to other accounting software packages, you can enter bills, create them from purchase orders, and pay bills as well. Every company has bills; we all have to pay the electric bill and buy office supplies. The purpose of a bill is to request payment for goods or services previously supplied. Your company must have Payables and Bills enabled in System Setup to access this feature. To enter a new bill, select File > New > New Bill or Vendor > New > New Bill. On the Items tab, you can then fill in the Vendor name, date of bill, description, and items. There is also a Memo field and a Reference field if you have information that would go there. The total is calculated at the bottom. Information on the Vendor tab is pulled from the Vendor's company record. On the Totals/Notes tab, you will see the total of the bill and can enter internal notes. Once you have all the information filled in, click Save to save the bill. 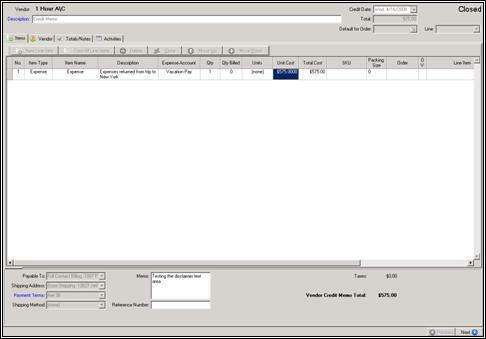 You can also convert a Purchase Order into a Bill. Open the purchase order and click the Convert > Convert To Bill button on the right. 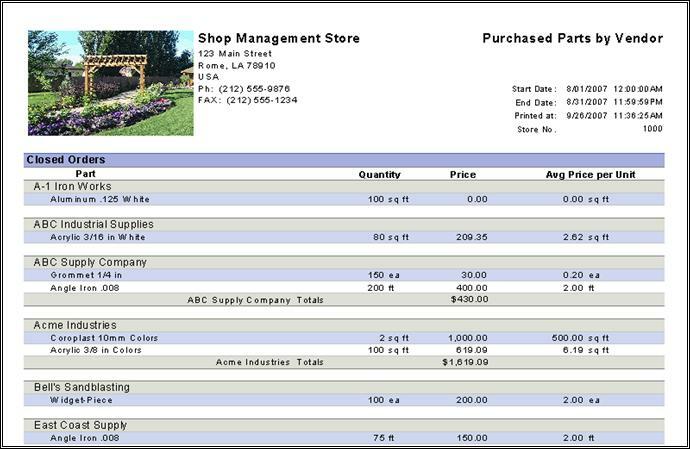 Any information that was filled in on the purchase order will transfer to the bill; however, you may need to change some fields on the bill, such as unit cost or shipping charge. You will also need to enter an Expense Account if one was not entered on the purchase order; this is a required field on a Bill, but not on a purchase order. Once you have all the information filled in, click Save to save the bill. Accounts Payable 550.00 This system account is used to track obligations to your vendors. Grommet Expenses 100.00 This expense account records the charges for the specified material. Paper Inventory 350.00 Accrue the value of this in the inventory asset account for the specified material. Shipping Expenses 50.00 This expense account records the charges for shipping. This may be setup as different parts or entered directly. Accounts Payable 550.00 Decrease the outstanding obligation. Bank Account 550.00 Easy come, easy go. To pay bills from your vendors, choose Banking > Pay Bills. A list of open bills will appear, and you will be able to select the ones you want to pay. You can then choose the payment date (the current date is the default), the payment type, and the bank account you are paying bills out of. If the payment type is by Check, you must also choose whether you will assign the check numbers or if the checks will be printed. Once you have all the options filled in, click the Pay button to the right. If you decide to pay bills at a later time, simply click Cancel, and no bills will be paid; the system will ask you to confirm a cancellation. To pay one bill, open Bill Explorer and select the bill you want to pay and open it, then click the Deposits/Payments button. This will open a Quick Bill Payment window, and you can fill in the payment type (cash, check, etc. ), the account used to pay the bill, check number if applicable, date of payment, and amount. 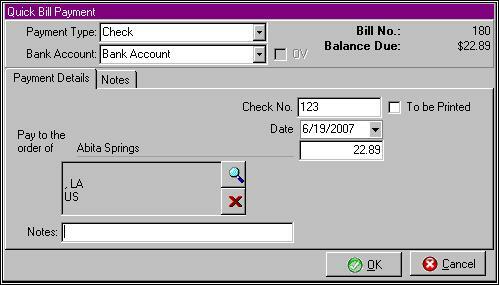 Alternately, you can right-click on the bill in Explorer and choose Bill Options > Make Payment to open the Quick Bill Payment window. Sometimes, you will write checks for items or services and then will need to enter them in Control. To enter a check that's already been written, enter the charge as a New Bill and save; the Quick Bill Payment will appear and you can enter the check number, date, and amount, and click OK to apply. For information about check formats supported by Control's (without customization), see supported_check_styles. Paying bills with cash is done similar to paying by check. Choose Banking > Pay Bills, select the bills you want to pay, choose the payment date, and select Cash as Payment Type at the bottom of the screen. Paying bills by credit card is done similar to paying by check. Choose Banking > Pay Bills, select the bills you want to pay, choose the payment date, and select Credit Card as Payment Type at the bottom of the screen. Your company may have more than one credit card, so be sure to select the correct card to use for payment. To void a payment that's been made on a bill, open the bill and go to the Activities tab. Locate the Payment activity you want to void, and double click; this will open a journal entry window with the payment information. Click the Void button on the right side of the screen; you will get a message stating that this may be part of a larger payment, and ask if you want to continue. Click Yes, and you will be asked for a reason for voiding this payment. We strongly recommend putting a detailed note for later reference. You can also right click on the bill payment activity and select Void to void a payment. 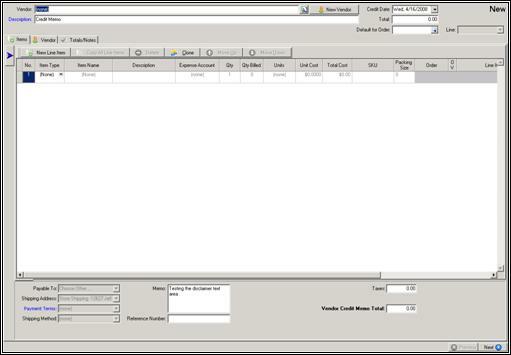 Vendor Credit Memos (VCMs) are used to adjust the vendor credit balance in the vendor record. The vendor credit balance may then be applied to bills to offset the balance due. Vendor credit memos work like negative bills. That is, the amount entered on each line item will actually credit (decrease) the expense account rather than debit (increase) the expense account. The total amount will then be debited to a system asset account called “Vendor Credits”. 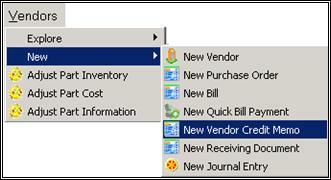 To add a new Vendor Credit Memo, click on the Vendors tab, select new, and click New Vendor Credit Memo. Doing so will bring you to the screen below. This screen will allow the user to create a new vendor memo. At the top of the screen, the user must select a Vendor to create the memo for. The user can also select a credit date. No. This is the number of the line item. Item Type. This displays the item type. Item Name. This is the name of the item. Description. This field displays the description of the item. Expense Account. This is the expense account that the item uses. Qty. This is the quantity of the item that is in stock. Qty Billed. This is the quantity of the item that has been billed. Units. This displays the unit that the part comes in. Unit Cost. This is the item's cost per unit. Total Cost. This is the total cost for the part. SKU. A code number assigned to an item for inventory. Packing Size. This displays the packing size for the item. There is also a box to type a memo on the credit memo and a place to insert a reference number. Clicking on the Vendor Tab will display information about the vendor. The Vendor's name is displayed. The user can also view all of the vendor's information by clicking “View Vendor”. The Vendor's contact's name is also displayed to the right of the screen. Beneath his or her name is their contact information, including their primary number and email address. On this tab, the name of the employee that entered the memo is shown. The selected due date is also shown. Also the payment terms and payment information is displayed. At the bottom of the window, there 2 separate note boxes. The first box is for Purchase Order notes. The second box is for Internal Notes that will not appear on the purchase order. This tab allows the user to look at activities. On this screen, the user has the option to select which activities should be tracked. There are 48 activities that can be tracked, including scheduled queries, payroll, and deposit made. The user can choose to track all activities or only certain ones by checking the corresponding boxes next to the activity. Class. The class the activity belongs to. Date. The date the activity began. Description. A description of the activity. Employee. The employee that did the activity. Completed. If box is checked, the employee completed the activity. Completed Date & Time. The date and time the employee completed the activity. Notes. Any notes the employee entered when completing the activity. Voided. If the box is checked, the employee voided the activity. Some vendors allow for a discount to be taken for early payment on a bill. This early payment discount can be automatically calculated in Control through the proper use of Vendor payment methods. You can see the discount added to a bill by looking on the Items Tab of a bill. To use Bill Discounts, they must be enabled through Accounting Setup in Control. By clicking on Payment Terms, there will be a check box that reads “Allow discounts for early payment.” The user is then able to set the number of days the payment must be early and the percent discount the vendor gets for paying. 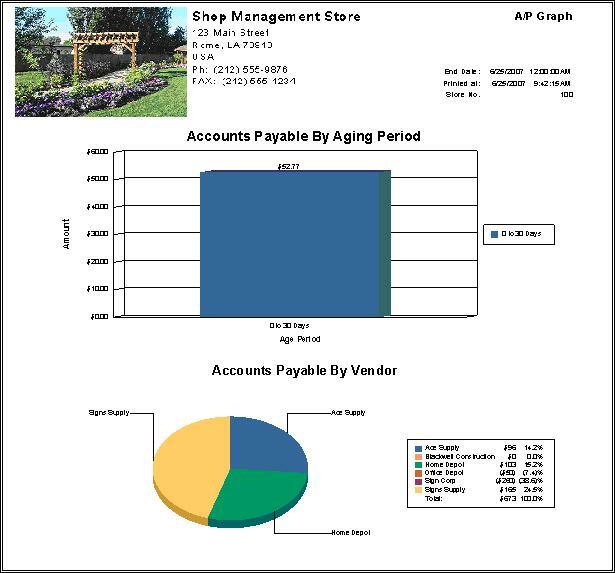 This is a graphical representation of Accounts Payable information in bar and pie graph form. Information in bar graph will be broken down by aging (current, 1-30 days, etc.) amount due, and information in pie graph will be broken down by vendor's percentage of total amount due. This shows a summary listing of AP aging items in a chosen date range. This is a detailed listing of the AP aging items grouped by vendor; this report is an option of the A/P Aging Summary. Each aging category will be totalled at the end of the report. This gives a listing of all payments made in a chosen date range grouped by bank account. This is included as an option in the Check Detail Listing report. This will give a more detailed listing of 1099 vendor payment information for the chosen date range; it will also break down information by company division if you are using them. This report will show a detailed listing of bill GL information. This report will show a detailed listing of parts purchased by vendor, grouped by vendor. Heading - Company information such as logo, address, phone, etc. This will show a detailed listing of bills for vendors. 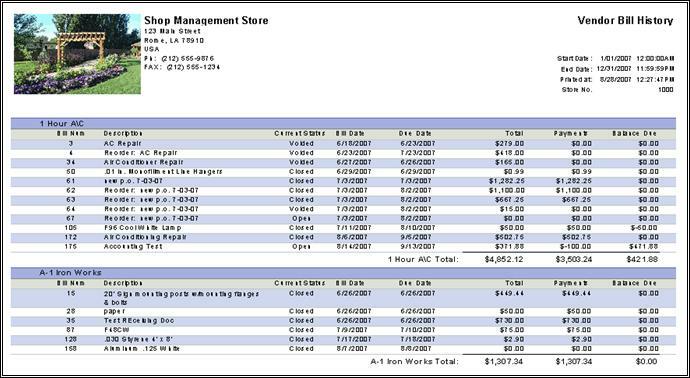 This report is included as an option with the Vendor Bill History Detail Report (see above). This will give a list of vendor contact information.